Halloween is only four days away so it’s time to really get into the spirit. One of my favorite ways to get into the spirit is to watch all of my favorite Halloween classics. I’m not the biggest fan of scary movies so my favorites tend to be of a less scary variety. Here are some of my Halloween film favorites! 1. The Haunted Mansion – One my favorite rides at Disneyland, I was ecstatic to see the story brought to life. Disney added in a lot of intricate details from the ride and Eddie Murphy and company gave it a good dose of humor. Definitely a must see for lovers of this Disney attraction. 2. Casper – The friendly ghost, the friendliest ghost of all! It’s enough to just see Christina Ricci and Devon Sawa as child actors! It’s a classic I love watching every Halloween, especially the scene with the Up and At ‘Em machine. Now, who doesn’t want one of those? 3. The Tower of Terror – Another one of my favorite Disney rides, the Tower of Terror is a great family Halloween movie! Starring Kirsten Dunst and Steve Gutenberg, the film focuses on five people who mysteriously disappeared in an elevator in the 20’s. It’s got crazy ghosts, evil witches, and a teenage and anxsty Kirsten Dunst. Win, win, win! 4. Hocus Pocus – One of the ultimate Halloween classics, if you have not seen Hocus Pocus, please stop what you are doing and immediately go watch it! I can’t even explain how good it is. The film focuses on three witch sisters who rise from beyond the grave when a virgin lights a black flame candle. Oh and, did I mention, Sarah Jessica Parker plays one of the witches. Seriously, go watch right now! 5. Scared Shrekless – One of my new animated Halloween favorites, Dreamworks Spooky Stories Scared Shrekless. It’s a family friendly tv short where Shrek and his friends decide to host their own scary story off in the abandoned Duloc castle to see who will be crowned the King of Halloween. Guess what, it’s on Netflix streaming now too! What is on your Halloween Must Watch List? Share with me in the comments below! I loved the Casper movies when I was a kid! I should re-watch them again this year. Funny story about my casper movie. Our house got broken into once when I was a kid. My Casper VHS movie was in the VCR and I never saw it again… luckily the VCR was already broken and the movie was forever stuck inside. So those VCR-hoodlum's stole a broken piece of equipment. Ha. I used to watch Casper and Hocus Pocus over and over as a kid! You've inspired me to revisit them. 🙂 I didn't know Shrek had a Halloween movie. I might check that one out with my daughter. Casper and Hocus Pocus! OMG my childhood!!!!!!!! A muck! A muck! A muck! lol! I love those movies. I don't like scary movies and don't have kids so I am not sure I have a favorite Halloween movie! 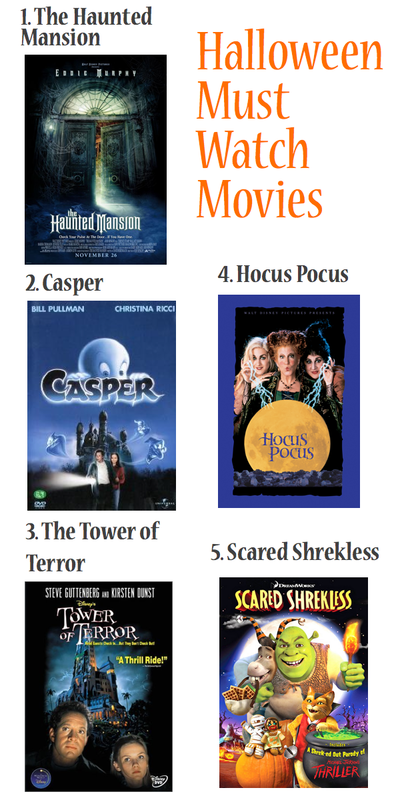 Awesome list Casper and Hocus Pocus are some of my childhood favorites. oh man i have not seen casper in SO long!! but i recently caught hocus pocus. 🙂 Such a good movie. After my experience at the haunted house with my kids this past weekend good scary movies are not on my list. I would love to sit down and watch Hocus Pocus with the kids. Hocus Pocus is one of the best movies, I have to watch it again it's been awhile. oh man, 2 & 4!!! Total yes!!! I remember the first time I saw Casper, Devon Sawa when he walked down those stairs, crush for daysssssss! and Hocus Pocus it just a tradition for me for sure! Thanks for sharing, gave me a good smile! Jeez, where have I been. I have not seen any of these moves. I have heard of all, but have not watched any YET! You have a pretty good selection we all can share with the little ones. As for me, Casper is my all time favorite. Happy Halloween! Hocus Pocus is about as scary as I get haha. I'm going to have to watch Shrek with my little man though! Hocus Pocus was my absolute favorite!!! I need to watch it again as an adult. Im sure it's a totally different perspective. This year I should probably introduce the littles to It's a Great Pumpkin Charlie Brown. You list is good for older kids though! Where have I been? I haven't seen any of these. My kids would probably like the one with Shrek. I love Hocus Pocus around Halloween!! Great list!